In 2014, McKinsey published a report suggesting that digital now influences at least 45% of all luxury sales. 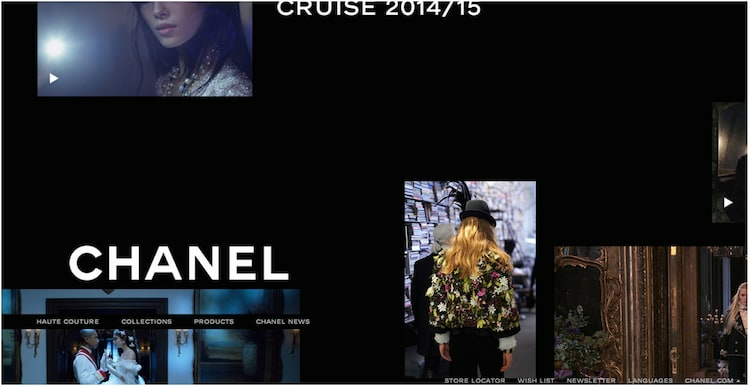 It’s understandable why luxury brands have been hesitant to move online. Yet, with print and display advertising returns decreasing, and luxury shoppers spending more time online and on mobile devices, luxury brands need to not only adapt to survive in the digital universe, but to thrive also. Having created our own luxury online platform (Qosy) at Venture Harbour, which has led to helping luxury brands such as Johnnie Walker, McLaren, and Marriott with their digital presence, I’ve learnt a lot over the past twelve months around the do’s and don’ts of luxury online marketing. In this post, I want to touch on 10 tips and lessons to help luxury brands use digital marketing effectively. As such, visual social networks like Pinterest represent a huge opportunity for luxury brands to raise brand awareness and advocacy. In fact, Chanel are one of the most ‘pinned’ brands on the social network, with over 1,244 pins of Chanel products pinned on the social network per day on average. This is made even more impressive when you consider that Chanel do not even have an account on Pinterest (it’s all driven by their advocates). A luxury brand that I came across who do an exceptional job of marketing themselves on Pinterest is 77 Diamonds in London. Their Pinterest profile is aspirational, educational, and strikes a great balance between not being too promotional, yet still raising awareness of 77 Diamond’s products. Generally speaking, luxury brand websites are very stylish, but perform poorly when it comes to user experience and functionality. 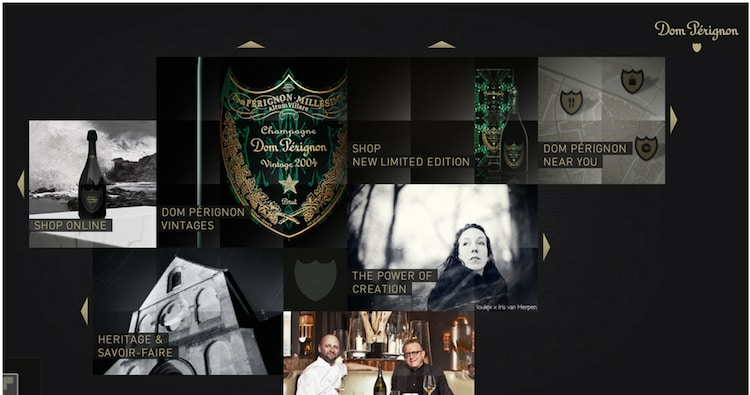 Take Dom Perignon’s website for example. Once you’ve completed a non-essential age verification page, you enter a slow loading flash site that takes about 13 seconds on a high-speed Internet connection to load. If you’re still around, you reach a website that’s very difficult and confusing to navigate. The Chanel website is very similar in that, while the colours and visuals are nice, the design is so unintuitive that it’s almost impossible to find what you’re looking for, let alone buy anything. While I appreciate the need for stylistic design, luxury brands need to invest in websites that are also intuitive and well desgined from a user experience perspective. Aston Martin and Versace are both great examples of what luxury brands should be doing with their websites. Their websites are visually stunning, while very easy to use, and highly functional. Want to capture up to 300% more leads without increasing your traffic? Join me on this free webinar where I’ll share the secrets behind the lead generation strategies of companies from Expedia and HP to startups like Crew – and how they’re generating 1,000’s of extra leads every month. In his book ‘Start With Why’, Simon Sinek explains how great marketing starts by explaining why they exist. Despite this, the majority of brands still market their products by explaining what they do. Communicating the story behind your products, and explaining the values that define a luxury brand, is fundamental to effective luxury marketing. Aston Martin do a great job telling the story of their brand heritage on all of their product pages and digital content. By explaining that your brand represents an assurance of luxury, quality, performance, style, or whatever value you stand by, you will find it easier generating advocacy for your brand online. Facebook Ads are one of the most effective forms of online advertising, thanks to the high level of segmentation and targeting that you can do. You could, for example, target ads specifically to married 35 year old males from Paris who like the brands Prada, Gucci, and Versace. You can even go one step further and target people by what college they attend, where they work, what their job title is, what music they listen to, and much much more. Google is one of the most influential channels when it comes to helping luxury shoppers find products, learn more about brands, and make their purchase. As we’ve already alluded to, most luxury brands have pretty poor websites. Unsurprisingly, most of those websites also have extremely bad SEO, making it difficult for their websites to rank well in Google for search terms that would otherwise capture potential customers. Take Prada for instance. When I search for Prada handbags, not only do I not receive a link to Prada’s handbag page (due to their poor keyword targeting, slow site, and poor on-site structure), but the results also look messy and untargeted. SEO is an untapped goldmine for luxury brands. If your site isn’t SEO-friendly, you’re likely to be leaving a lot of potential traffic and revenue on the table. 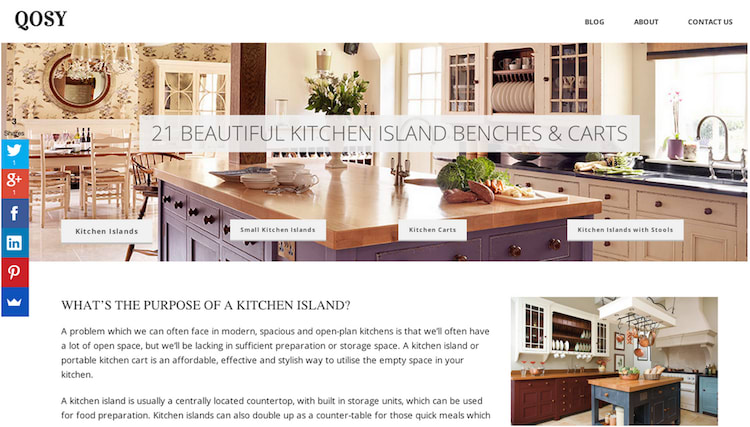 One of the most effective ways we’ve found to generate traffic and engagement for Qosy is create highly visual and aspirational content, such as our guide to kitchen islands. By focusing on long-form visual content, we’ve generated 10,000’s of social shares, and a huge amount of SEO traffic. While common in many other niches, content marketing is massively underused and enormously effective for luxury brands. In Jonah Berger’s book, Contagious, he explains that one of the main reasons why people talk about things, and spread word of mouth (online or offline) is to display the traits that they want others to see in them. Charities, for example, are one of the most liked categorises of pages on Facebook. While some of this can be explained by altruism, it’s been found that the main driver for liking a charity on Facebook is to show others that you’re charitable. Because one of the primary motivations for buying luxury goods is to display status, brands can take advantage of this by creating and publishing content that, when others share, will make them look stylish, smart, or cool to their friends. We found this with Qosy when we created our guide to the best scotch. 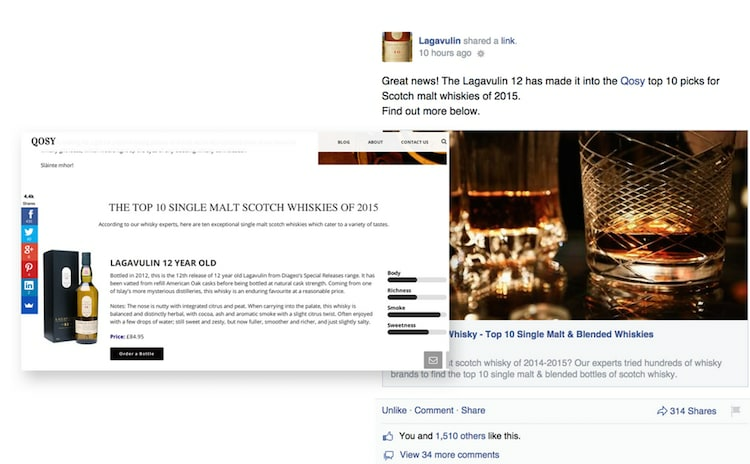 Within 48 hours of publishing the guide, over 4,000 people had shared it – many of whom were using the guide to show off their own scotch knowledge. Exclusivity is fundamental to luxury brand marketing as it maintains consumer desire through scarcity and rarity. If anyone could walk into Louis Vuitton and buy a handbag, Louis Vuitton would lose their appeal to those who wish to have something that others can’t get access to. Given the Internet’s accessibility and autonomy, many luxury brands worry about losing their sense of exclusivity when it comes to going online. This, however, is flawed logic. For luxury brands, the Internet does not represent wider distribution of actual products. It’s a wider distribution of the content that evokes the desire to buy luxury products. Translated to the offline world, effective digital marketing is like running more advertisements on buses, or more TV ads, or having more stores in Central London. Exclusivity can be created online through private member groups, concierge services, or digitally-delivered loyalty perks that are reserved specifically for previous customers. Email marketing is extremely effective for eCommerce marketing and increasing customer loyalty, as it provides the opportunity to educate consumers and tell them about new experiences or products offered by the brand. 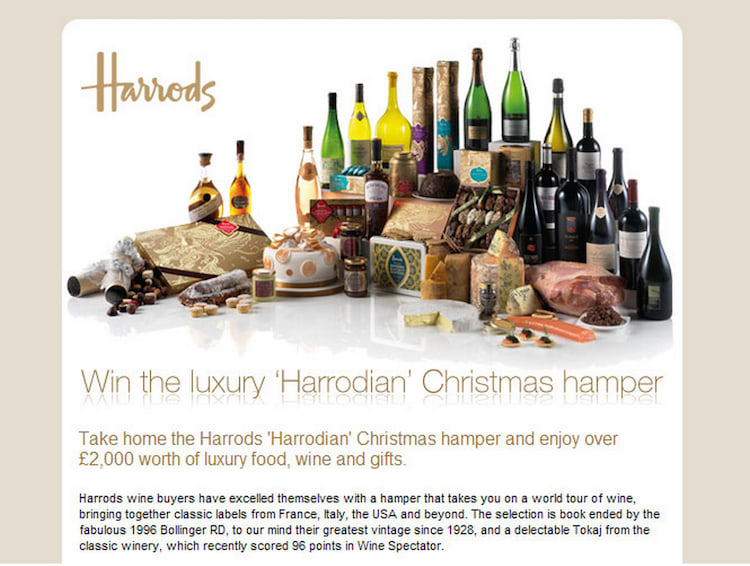 Harrods do an exceptional job with their email marketing campaigns, and are well worth subscribing to for email campaign inspiration. In the near future, talking about online and offline will be like talking about the benefits of our left leg vs. our right leg. Both are integral to the other. One luxury brand who are leading the way in combining the in-store and online experience is Burberry. It seems that every few months Burberry are running a new online brand-awareness campaign, driving luxury shoppers into their stores. Once those customers are in the stores, they’re encouraged to take pictures, share content, watch live streams, and use in-store iPads. Amazing advice for us start up businesses! How would you compare the facebook ads with Google adwords? If my target audience is small but people with very high purchasing parity, what would work best for me?